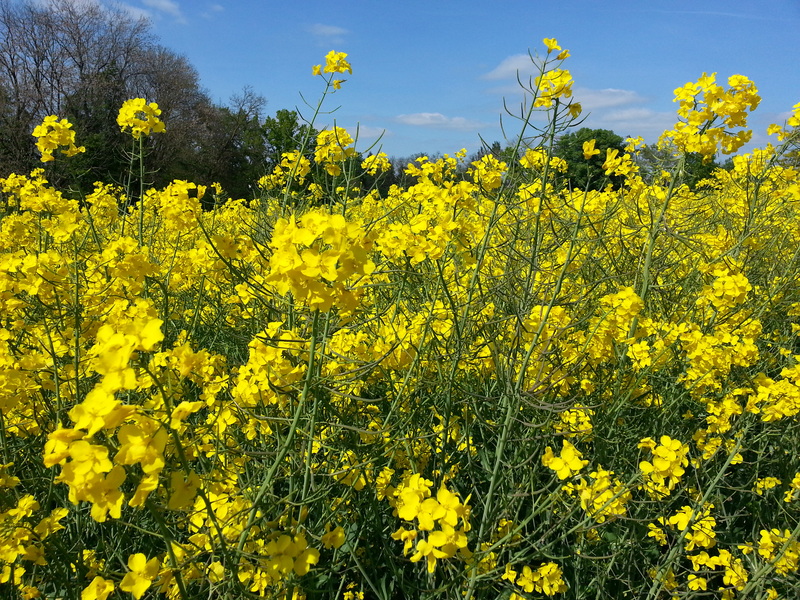 as uncertain moment of spring. My adventure with Mr Muscle, WC Duck and Kiwi bird (“which shoe will revive”) was as short as “uncertain moment of Spring” from the song of Jan Pietrzak. It looked completely different in the previous corporation – I worked there until seventeen moments (years). Since I made a reference to the famous Soviet TV series from the seventies of the 20th century entitled “Seventeen Moments of Spring”, it behooves to write more about it and give you some jokes about the main character, who was Chuck Norris of that time (of course, behind the poorer side of the Iron Curtain). Colonel Maksym Maksymowicz Isaev works in Berlin as a secret agent of Soviet intelligence Standartenfuhrer Max Otto von Stirlitz. He infiltrated the ranks of the SS and works in Reich Security Main Office. The theme of the movie is the realization of the task that Stirlitz receives from headquarter in Moscow – to find out which of the leaders of the Third Reich, is trying to establish negotiations with Western Allies in… Switzerland. He has to obtained evidence that such discussions are ongoing to prevent the conclusion of a separate peace between the Nazis and the Western powers. Isayev thanks to his incredible intelligence, calmness and good luck, of course, executes the task. This, however, has not been done without problems. He has to tackle with the head of the Reich Security Main Office – Kaltenbruner who having suspicions against him ordered his observation, and with the head of the Gestapo – Müller. Stirlitz has walked through the streets of Berlin, but something betrayed him as a spy: maybe hat with ear flaps, maybe felt-boots or maybe a parachute pulling behind him? Stirlitz sauntered approached the the place of contact. He knocked the agreed 127 times. No one answered. After some thought, he went out to the street and looked to the window. Yes, he was right. On the windowsill 63 irons were standing – a sign of a bummer. Stirlitz’s house was surrounded by Gestapo. - Open the door! – Müller shouted. - Stirlitz is not at home! – Stirlitz said. In this here’s clever way Stirlitz outsmarted Gestapo for the fifth time. Gestapo guarded all the exits, but Stirlitz outsmarted them. He escaped through the entrance. Stirlitz thought. He liked it, so he thought again. End of kidding, I go back to the main topic. Since the beginning of the recruitment process S.C. Johnson made it clear that this is a temporary work. They needed someone with experience, who quickly embrace the situation in the difficult period of change and restructuring, but unfortunately it will not be employed on a permanent basis. It was expected that the contract will last for 6 months. Finally, it turned out that I was needed a bit longer, and the contract was extended to 24 months. With regret I leave the company and the people, because it was… different than previously. Calmer atmosphere and less deadllines result from company size and ownership structure, since SC Johnson is not listed on the stock exchange. I am not a psychologist and I did not conduct a research, so I can not say for sure, but with a simple observation I deduced that it has a soothing effect on the behavior of employees and their superiors. The excerpts of the next paragraph have been censored by the US Senate Committee on Commerce, Science and Transportation, due to the critical significance of the issues I dealt with to the vital interests of this American family-owned company, founded in 1886, in Racine, Wisconsin. In addition to the structured process of month end closing, █████████████████████, transparent deviations reporting, ███████████████████████████████████████████████████, regular costs monitoring of the implementation of the European CLP project (Classification, Labeling and Packaging), and █████████████ █████████████████████ ██████████████, I wanted to leave something else, but directly related to the atmosphere in the office (though perhaps more accurate is to write – out of the office). 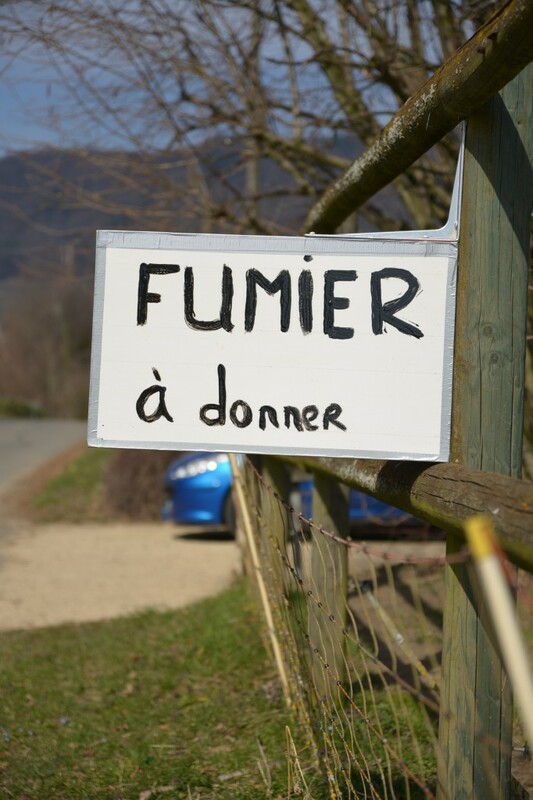 Employees of companies located in the ZA La Pièce (ZA – artisanale zone) are very privileged. 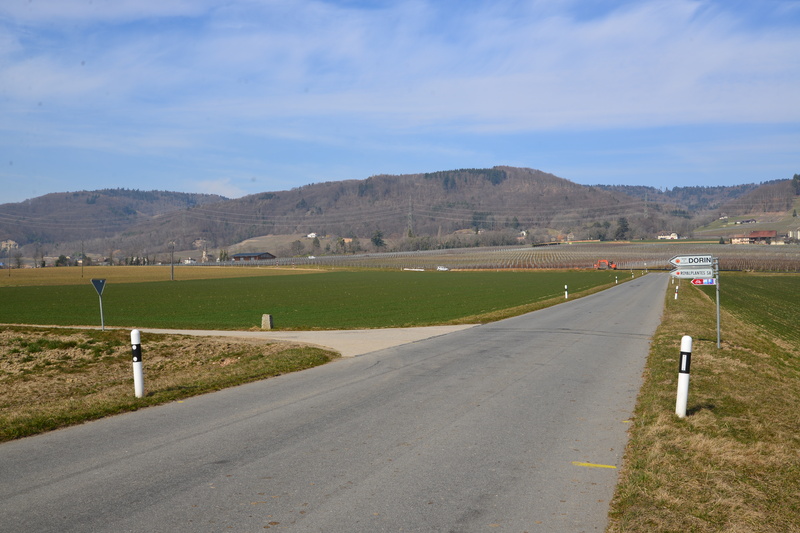 20 meters from the most westerly building B1, beyond the road Route de l’Etraz, farmland begins, stretching further to the west in the direction of Nyon and Geneva. 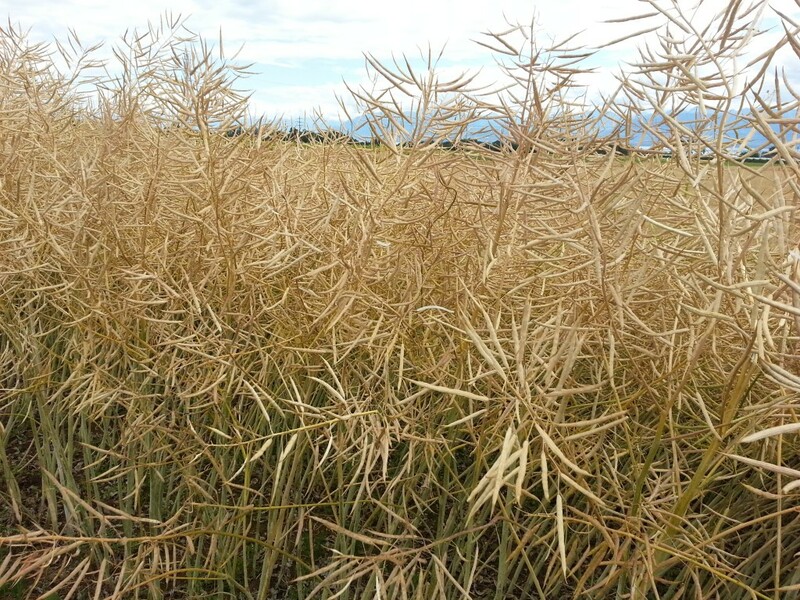 According to the principles of crop rotation, local farmers plant there different plants: corn, sunflower, colza, beets, carrots and corn. From time to time appear also fruit orchards. And gave to drink the water to the old man. How nice would be to eat a few pears! And the most beautiful pears gave. Through the scenic and well-maintained fields stretch concrete paths, equal as a table, through which farmers can get to their land and take care to make them even more scenic and well-maintained. These paths are ideal also for running and I am glad to say that I was using them for this purpose on a regular basis! I didn’t do this alone. It appeared that my colleagues from SC Johnson and neighboring companies were very sporty. Importantly, higher levels of management were also running regularly and gave blessings for the disappearance of 1 – 1.5 hours during the working day. Of course, the duties and responsibilities needed to be done with the utmost care, and length of stay in the office properly extended. Although, not always… I have already mentioned that Friday afternoons in the summer were intended for cycling for volunteers; uninterested could just went back home earlier. 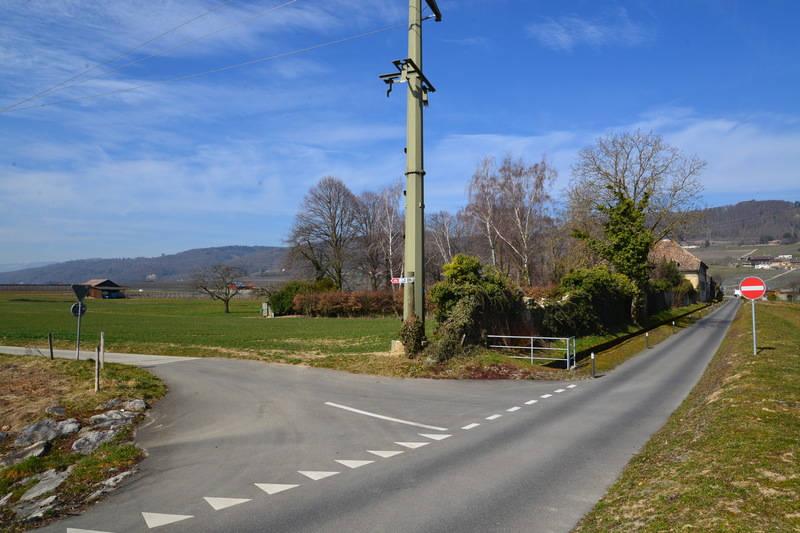 The path runs initially parallelly to the highway Lausanne – Geneva, under the high voltage wires. 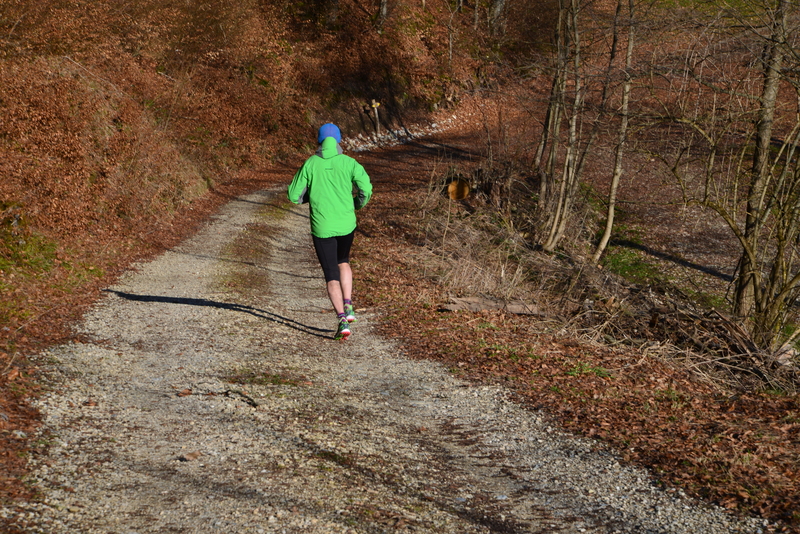 After 650 meters I run slightly up to the Route de Gilly and turn right toward the nearby hills. 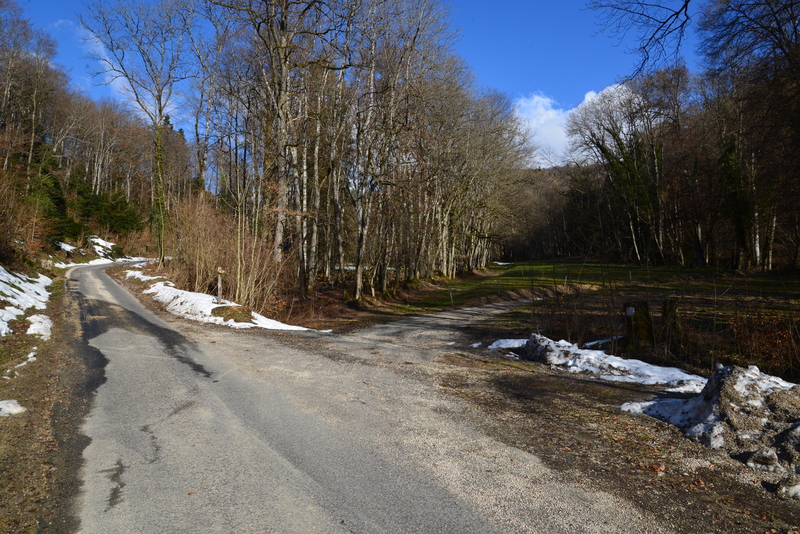 After 100 meters turn left, again onto a concrete agricultural road Sur la Dolle. 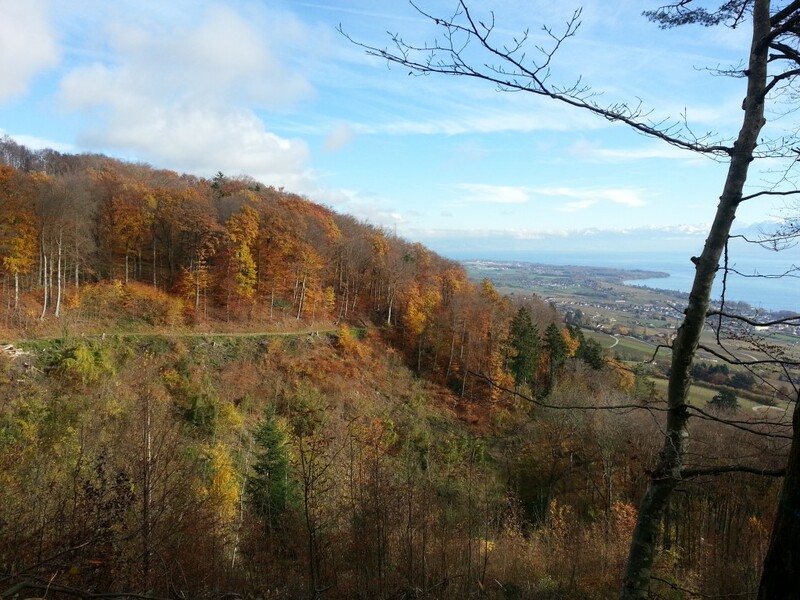 The name probably derives from the summit of La Dolle, which can be seen straight in the not too distant Jura mountains. After 160 meters I reach the important point on the route, because here I have to decide whether to continue the training on flat or hilly ground. - But why uphill?! – wailed duck Disaster. - Because we’re in the mountains and in the mountains it is not possible all the time to go downhill. Sometimes it is needed to go uphill but later going back is downhill – with one breath breathed dog Pypeć. So I leave the bike road and I turn to the right slightly uphill. 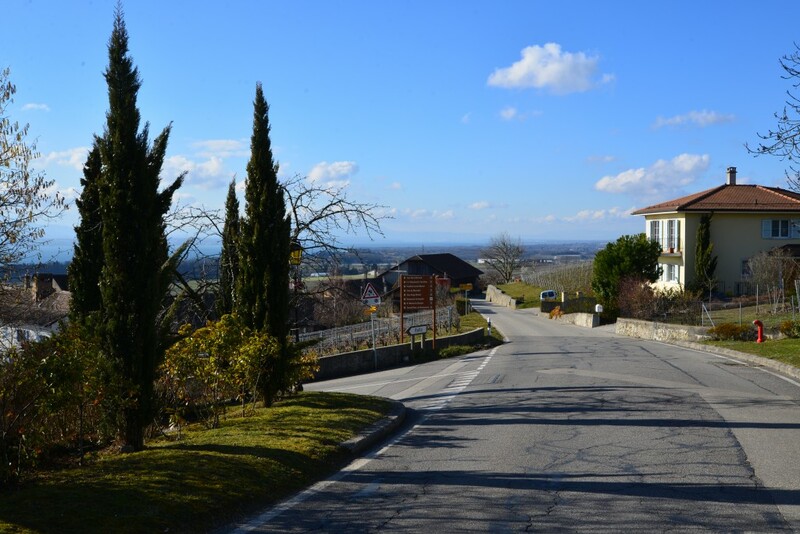 I cross the main road Route de l’Etraz and continue ascent having on the right side the narrow stream bed and the bushes of the grapes on the left. 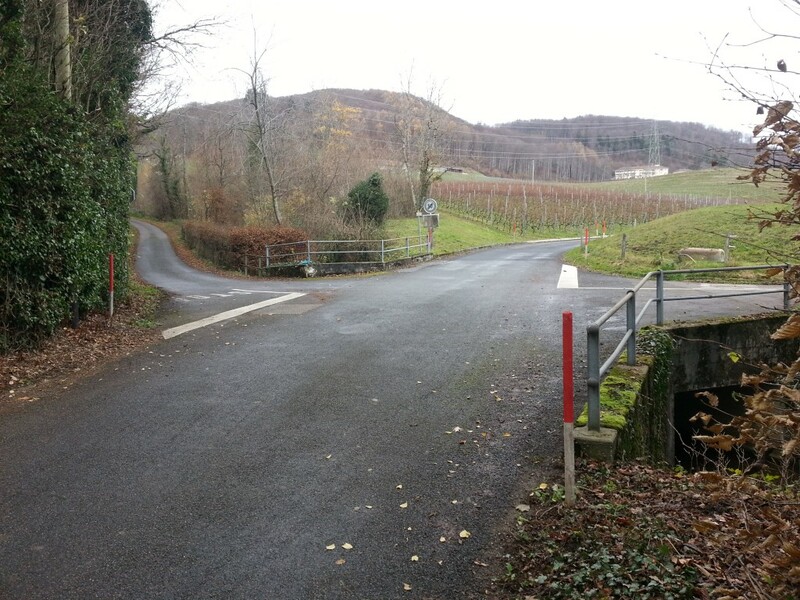 Behind the corner of the vineyard I turn left and run stright untill the street Les Truits, where I turn right, then right again, uphill, in the direction of Vincy, as shown by the road sign. 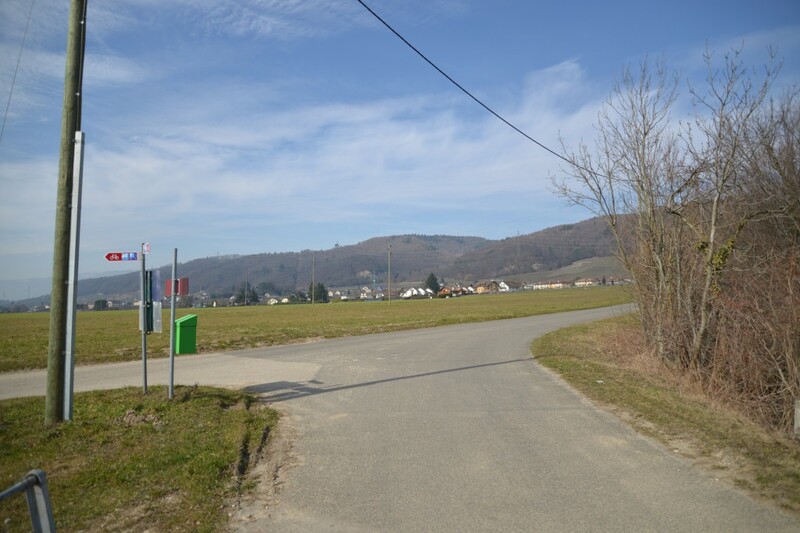 At the end of Route Sous-Vincy, on the left side there is a church, which I pass and crossing Route de Tartegnin, I run further up the Route de Vincy. Finally, I run into Vincy. Bend of the road turns right at a stately mansion – this is Château de Vincy. Further, at the intersection I turn left and immediately right towards the hospital. I pass fountain on the right side and then another impressive building on the left. 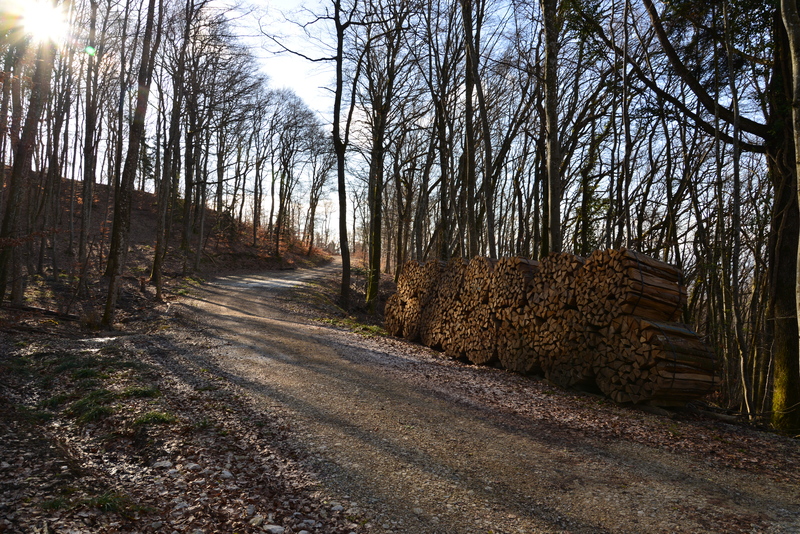 After a while, before the stream, I leave the main road and turn left, into a steep asphalt route through the forest (Chemin des Vaux). Now, just me and the way up… Silence… interrupted by the sound of cowbells in the meadow on the right… Peace… (during 9 months of regular running, passed me on the way up only 5 cars of locals). Me and the way up… Steadily I climb higher and higher. On the right side murmurs the brook Gillière. Do not deviate into the paths departing from the main road to the right and left (although they are possible route options for the curious). 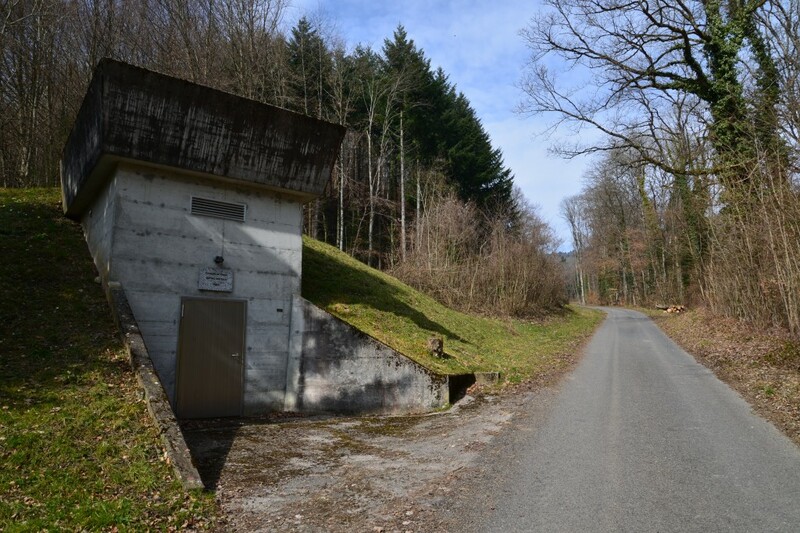 After about 600 meters from the beginning of this road I pass on the left side the water supply station (Service des Eaux). Behind the building from 1980 I continue straight ahead, up to the point at the first kilometer from the beginning of the climb (approximately 4 km from the start). From here, it is possible to run further up on the asphalt (what I was doing sometimes) but today I have chosen path to the right. I cross the brook and on gravel path (gravel – finely crushed stones used, inter alia, to pour pavement), swinging by a gentle curve to the right, I climb. All the time it is needed to regularly climb higher and higher. The path winds its way through the wooded slopes once to the north, once to the south. 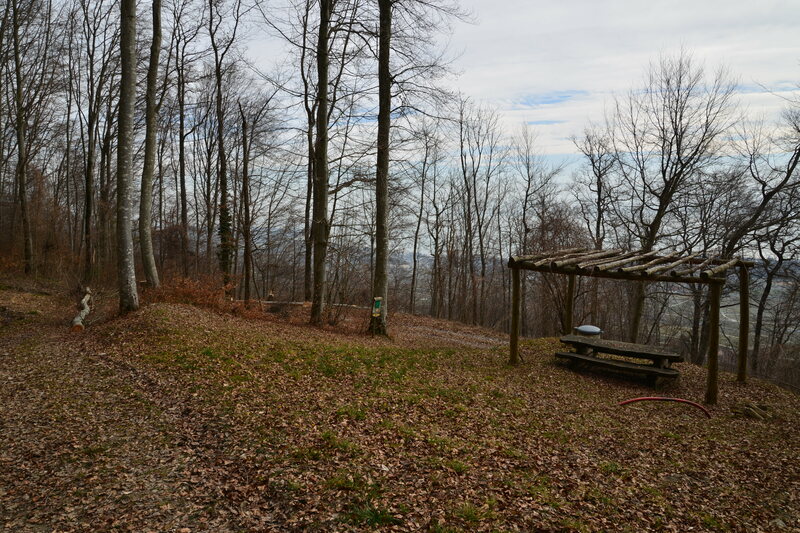 Finally, after about a kilometer from crossing the stream (5 km from the start in ZA La Pièce), I reach the highest point of the route (760 m). It offers a wonderful view to the east. 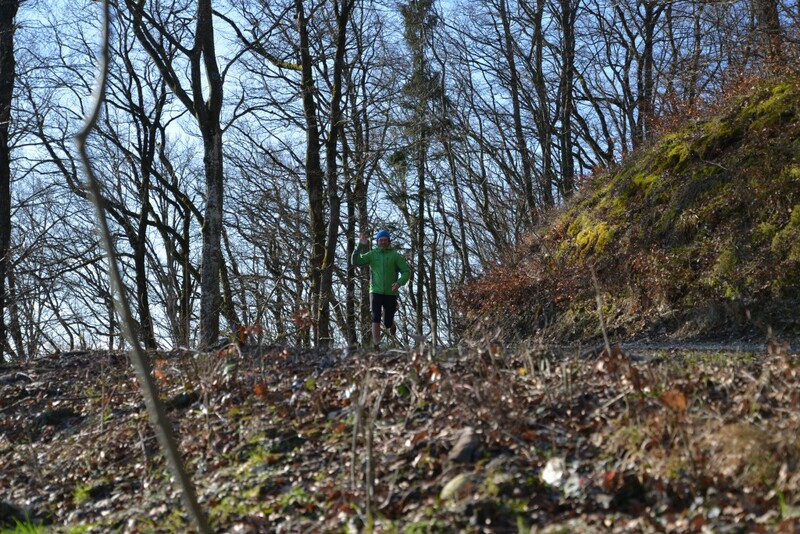 In the foreground seen the opposite slope and the path on which runs some guy in green Mammut Kento DRY Tech Premium jacket, MTR 201 3/4 Tights pants, Stollen beanie and MTR 201 Pro Low shoes. Further seen Lake Geneva and finally alpine mountain peaks from Rochers de Naye to Dent d’Oche. 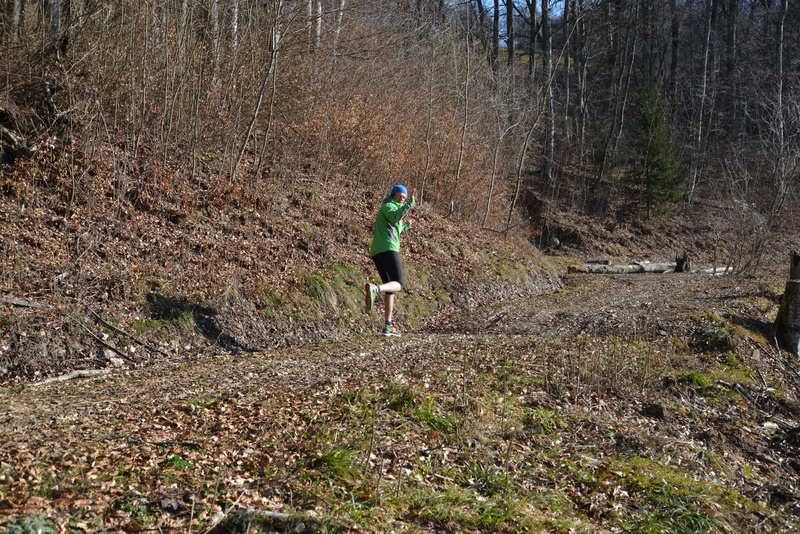 I run a few meters down and turn right, more down (the path straight up leading finally to some farm). Running down I approach to the wooden barrier… Sudden vortex of space-time continuum shifts me to its other side and dents to the ground. I quickly get up, swallow saliva to unclog ears after a sudden jump in pressure and move on down. I look to the right and see some guy in green Mammut Kento DRY Tech Premium jacket, MTR 201 3/4 Tights pants, Stollen beanie and MTR 201 Pro Low shoes, apperaring on the highest point of the route, on which I ran up a moment ago. The path this time steadily decreases towards the east-south-east. After the rain needs to be careful, because can be very slippery. 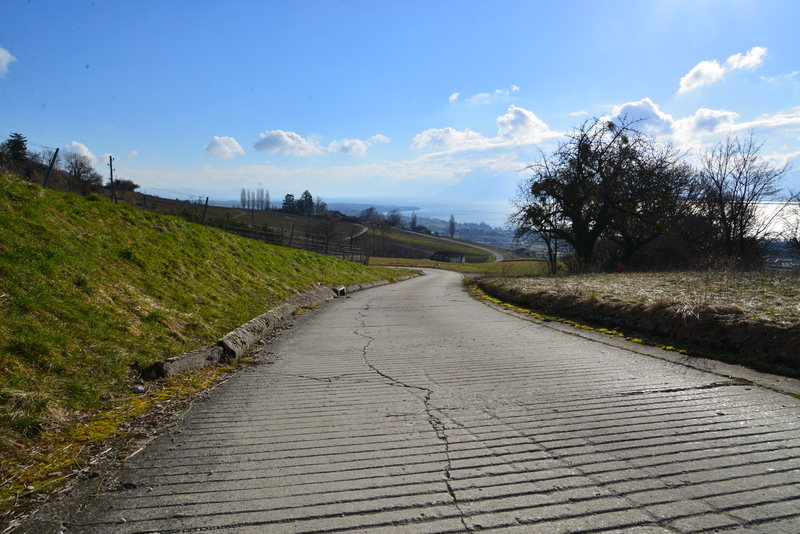 After some time, at wooden benches covered by the roof, the road turns 180° to the right, toward the west-north-west. Behind a wooden barrier path turns again to the east-southeast and it appears that this fragment was once asphalt. Running in the autumn and winter, below on the right seen the roof of Hôpital de Gilly. In the end, the path runs out of the woods. Running to the right I would get to the hospital. No thanks. I do not recommend either option to the left, back to the forest. I checked. Have to wade through the raspberry bushes, hurting calf, climb a steep ravine and then go through the barbed-wire fence and across a pasture finally get to Route de Châtel leading down to Tartegnin. Therefore, I run straight down alongside the vineyard to the road La Bossenaz and turn left. The path leads steeply down and therefore is carpeted with corrugated concrete slabs so that cars do not slip in the rain or in winter. Behind the bend to the right, I pass on the left side the garbage dump (déchetterie). A dozen or so meters below, I turn right into the Route de Beauregard and after further 200 meters to the left, heading to Rolle. 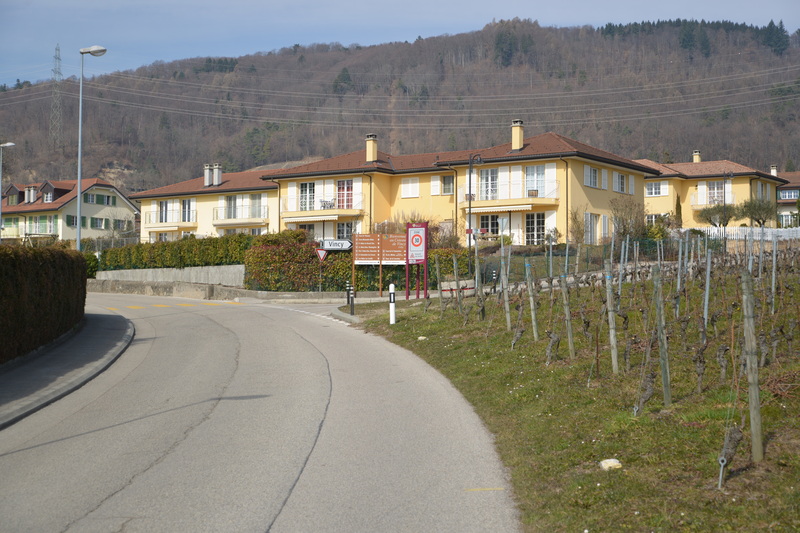 Rue des Pressoirs leads all the way down through Tartegnin (called Pays du bon vin) and then through the vineyards to the main road Route de l’Etraz. I reach the building B3 after about 8.2 kilometers. Running this route takes me approximately 50 minutes, then yet shower and full of energy I sit at the computer again. I mean… I was sitting. Till it remakes you, bread eaters – into angels.